Tara Helfman was at IILJ as an Olin/Searle Fellow. She currently teaches Contracts, Constitutional Law I, Law of the Sea, and International Law at Syracuse Law. Her primary research interests are public international law and legal history. She is the coauthor with Edgar McManus of the two-volume Liberty and Union: A Constitutional History of the United States (Routledge: 2014). 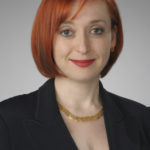 Before joining Syracuse Law, Professor Helfman was an Associate at the New York office of Debevoise and Plimpton, LLP, in the International Dispute Resolution and Securities & White Collar Crime Practice Groups.